Virtual reality has enjoyed a boom over the last few years thanks to exponential improvements in home-computing power and the launch of (relatively) affordable devices such as the HTC Vive, Oculus Rift and PlayStation VR. While most virtual reality projects are aimed at the gaming market, some pioneers are working hard to expand its potential in more original areas. 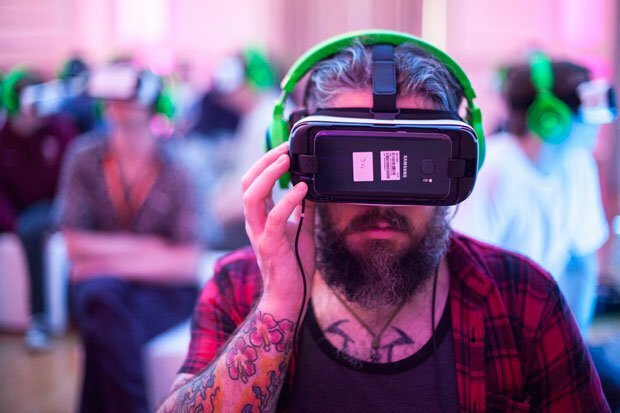 Daniel Burke-Ward and Nikita Wolfe Murray, founders of Edinburgh-based digital art collective Reality Is Only Screen Deep, are interested in using VR to explore interactive artworks. For their Immersive Gallery exhibition at FuturePlay, Burke-Ward and Wolfe Murray have persuaded two digital artists – Handiedan and Dustin Lewis (aka Mr Clandestine) – to use a Google software application called Tilt Brush in conjunction with the HTC Vive hardware to create two interactive works. Artists are able to use the equipment (in conjunction with a pair of handheld controllers), to digitally 'paint' in 3D space an area the size of a small room: multiple areas can be painted and linked together using a 'teleportation' feature. Under supervision by Burke-Ward and Wolfe Murray, visitors to the exhibition will wear VR headsets to explore the artworks in four dimensions; as well as being able to walk around and fully examine them from all angles, the installations will change over the course of each 25-minute session. It's a unique way to explore digital art. & 4 Aug (from 11am), £6 (£5).